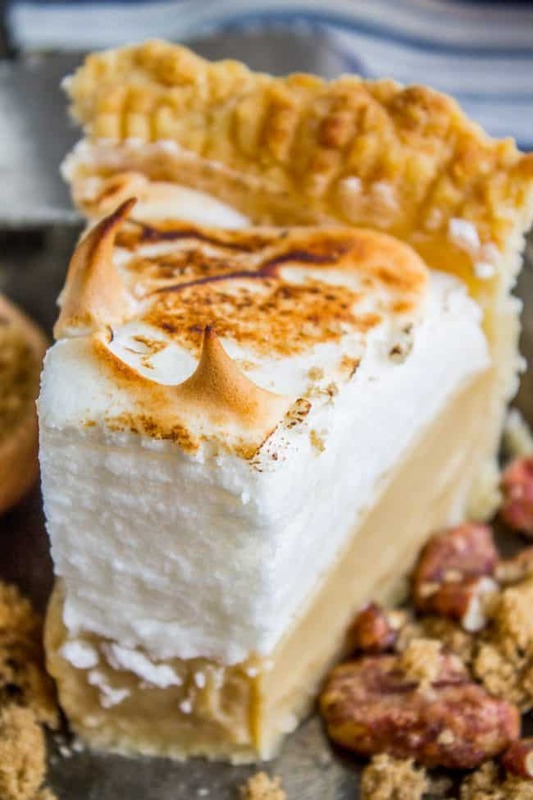 This Butterscotch Pie with Meringue Topping has a buttery flaky homemade crust, dreamy creamy butterscotch pudding, and the fluffiest, sky-high meringue in all the land! 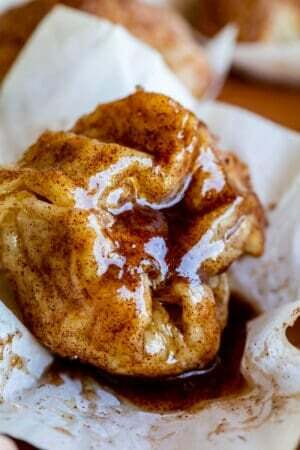 Top with crunchy candied pecans and a sprinkle of brown sugar, and you are going to be in heaven. No matter how many times I explain it to my 5-year-old son Truman, he is just not picking up on the fact that December and all things Christmas come AFTER Thanksgiving. His Sunday School teachers gave him a cute little advent calendar at church on Sunday (so sweet, right?) and when I told him we still had ELEVEN DAYS before we can even open the first one, he was quite dismayed. My mom just emailed my sisters and I an idea about a reverse Christmas Advent calendar, where instead of getting candy, you add canned goods or supplies to a box every day to give to the needy. To emphasize giving instead of receiving. My sister Nikki said, “Oh I like that a lot better than having chocolate each night. 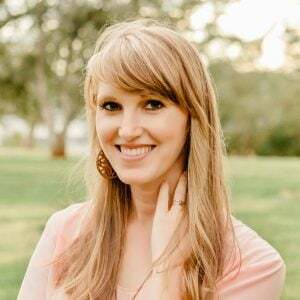 I have banned the chocolate advent calendar from my home in the name of Christianity.” She has 5 kids and I think I would do the same thing if I had 5 children screaming about Chocolate Countdowns every night. But really we are getting ahead of ourselves here, we are T MINUS 3 DAYS til Thanksgiving, the best food day of the year! It’s the best because of all the PIE. I’ve got one final pie for you guys to make for Thanksgiving. It’s the perfect pie to add to your menu after your final shopping trip, because it only uses pantry essentials. There’s always room for one more pie, right?? Have you had a Butterscotch Pie before? I’d never even heard of it before my sister Laura told me about it last year. It’s been on my to-make list for a long time! You start out with a buttery, flaky homemade crust that you pre bake in the oven before adding the filling. Then there is a thick layer of homemade butterscotch pudding, topped with a tall and dreamy meringue. 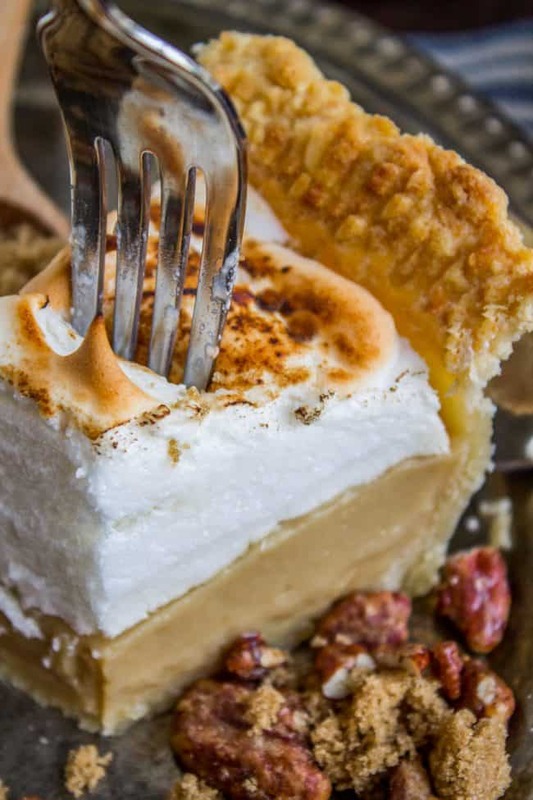 Butterscotch is my absolute favorite type of homemade pudding, and turning it into Butterscotch Pie by adding it to a crust and topping with meringue can only make things better. The pudding has a deep butterscotch flavor from cooking the brown sugar, and just enough salt to cut the sweetness. Egg yolks make it nice and creamy, giving it a luxurious texture. Adding butter at the end gives it that perfect butterscotch flavor. I have FINALLY found a meringue that I love! 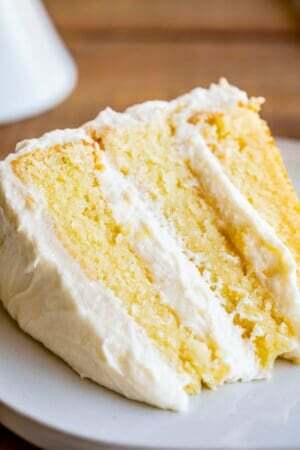 I’ve had a meringue recipe that I’ve made for years that has great flavor, but it always starts weeping on me. Today’s version held up a lot better. I found it in my trusty Better Homes and Gardens cookbook. You make a cornstarch water slurry and add it to your beaten egg whites. Have you ever tried it? It worked out great. My meringue held up for way longer than it usually does. The nice thing about this pie of course is that it’s meant to be served cold, which means it’s perfect for making a day ahead of time. Whip this up on Wednesday and it will be all ready to go on Thursday. 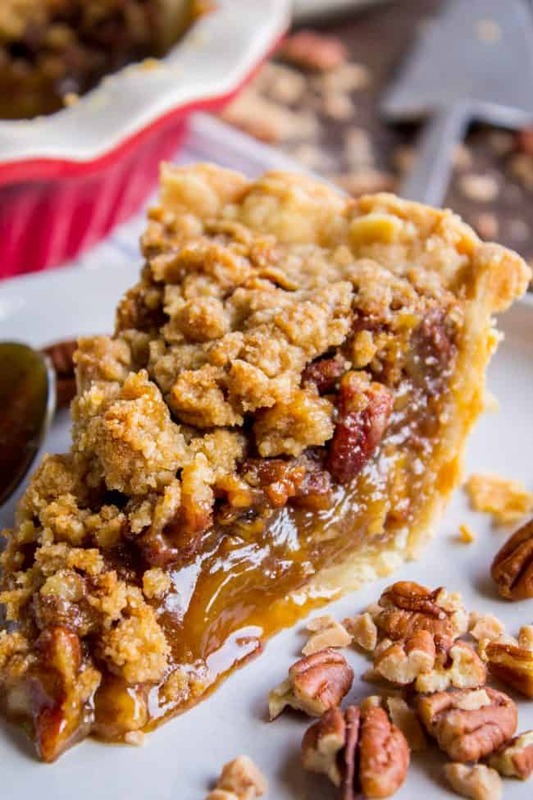 You can definitely serve this pie as is without any garnishes, but last minute I decided to top each slice with a sprinkle of brown sugar and a few chopped candied pecans. I used the pre made kind that you get for topping salads. You can also try making your own. 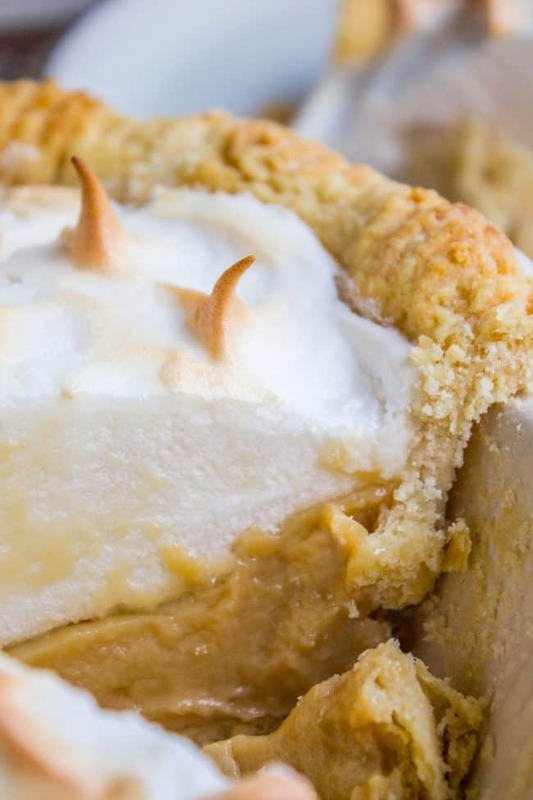 It added the perfect crunch to offset this dreamy creamy butterscotch pie! Now make the pie crust. Fill a small bowl with ice and water so it is ready when you need it. In a large bowl, whisk together flour, sugar, and salt. Use a pastry cutter or fork to cut in the butter-flavored Crisco. * Cut with the pastry cutter until it looks like coarse crumbs. Don't overdo it! You want pea-size chunks of shortening. In the small bowl with 1 egg yolk, whisk in 1/4 cup ice water, then add it to the flour mixture. Stir until it with a fork until it is just coming together, then use floured hands to knead it a few times (only to make it come together). Divide the dough in half. Shape one half into a disc, put it in a ziplock, and stick it in the freezer. Save it for another pie another day! Arrange the pie crust and fold any excess crust underneath (I don't believe in trimming it off. Just fold it under!) Crimp as desired. I used a fork, easy peasy. Use the same fork to prick the bottom and sides of the crust all over. Place the pie pan in the freezer or fridge. It should chill for at least 30 minutes. Preheat your oven to 450 degrees F.
When your oven is very hot and your pie crust is very cold, line the bottom of the pie crust with foil. Fill with pie weights, coins, dried beans or rice, whatever you have. This will prevent bubbles from rising up. Bake at 450 for 8 minutes. Remove the foil and pie weights. Return to the oven and bake for another 7-8 minutes, until the bottom of the crust is no longer shiny. Remove from the oven and set aside. 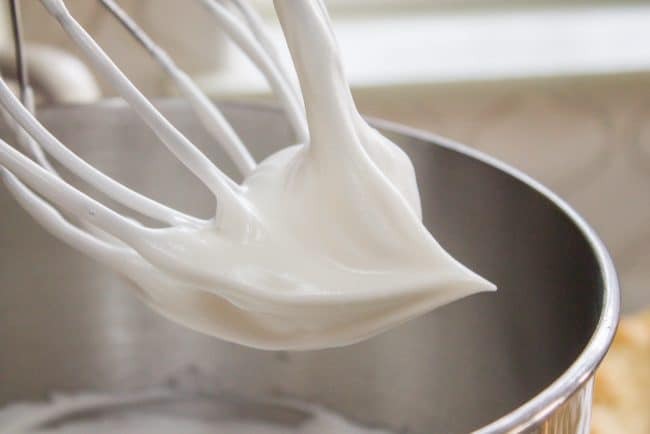 Lower your oven temperature to 325 degrees F.
For the meringue: In a liquid measuring cup, add 1/2 cup COLD water and 2 teaspoons cornstarch. Whisk together well until there are no lumps. Microwave on high for 30 seconds, whisk again, then microwave for another 30 seconds, until it has formed a glossy gelatinous liquid. Don't turn off the mixer. Slowly pour in the warm water/cornstarch mixture. Continue beating until stiff, glossy peaks form when you lift the beaters out. The tips will stand up straight and not droop at all. See photo. 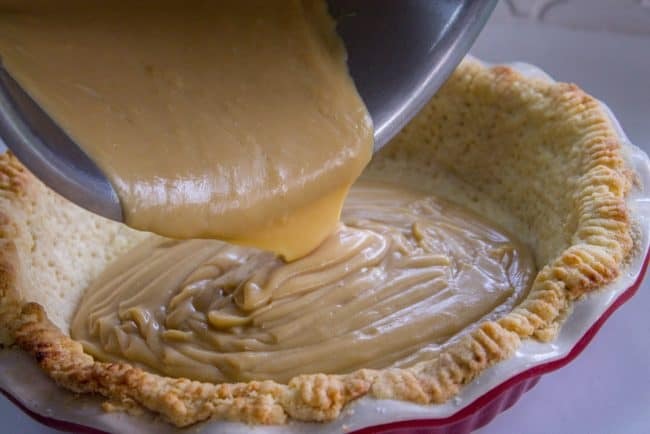 For the butterscotch pudding: In a medium saucepan, (off heat) whisk together brown sugar, 1/2 teaspoon salt, and 2 tablespoons + 1 teaspoon cornstarch. 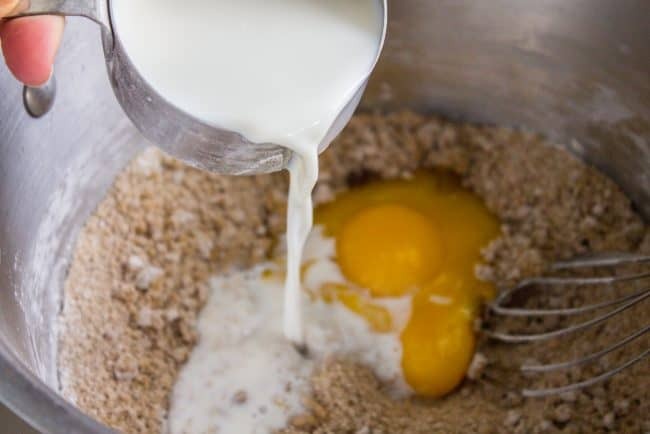 Add the milk, cream, and the 3 egg yolks you set aside earlier. Whisk it all together. Set the pan over medium heat. Bring to a boil, whisking frequently. Once it boils, set a timer for 1 minute, whisking constantly. Your spoon should leave marks in the top of your pudding. 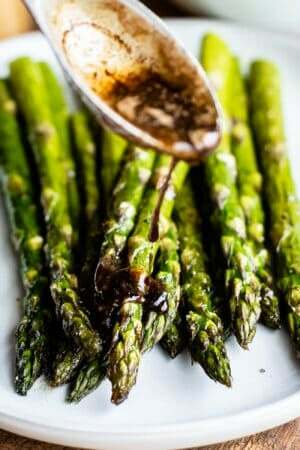 Remove from heat and add 2 tablespoons butter and 1 teaspoon vanilla. Stir until melted. Beat the meringue on high one last time, and QUICKLY spread the meringue on top of the HOT pudding. 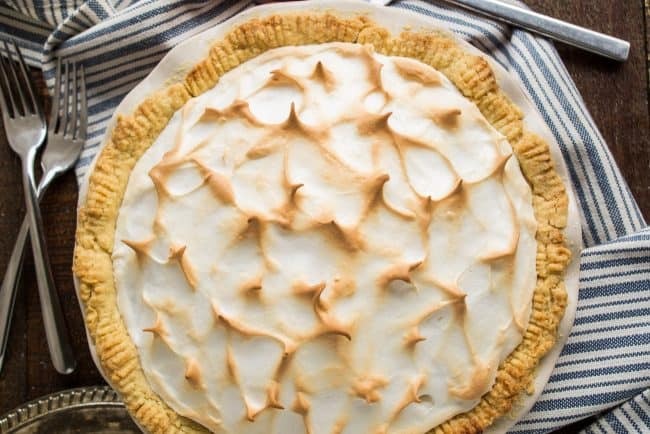 The meringue should touch the pie crust to completely seal the pudding. Swirl or dollop the top or your meringue however you like. Bake at 325 degrees F for 25-28 minutes. The top of your meringue should be browned (not black, I did that with a kitchen torch later). If you really want to avoid your meringue weeping, use an instant read thermometer to test the center of the meringue (hold it at an angle). It should read 160 degrees. Let the pie cool on a wire rack on the counter for about 1-2 hours. Transfer to the fridge and chill completely 3-6 hours. If you want the darker toasting on the meringue, use a kitchen torch just before serving. 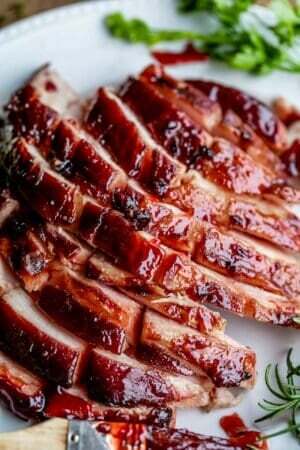 Serve with a small sprinkle of brown sugar and some chopped candied pecans. Cover the pie for longer storage in the fridge. 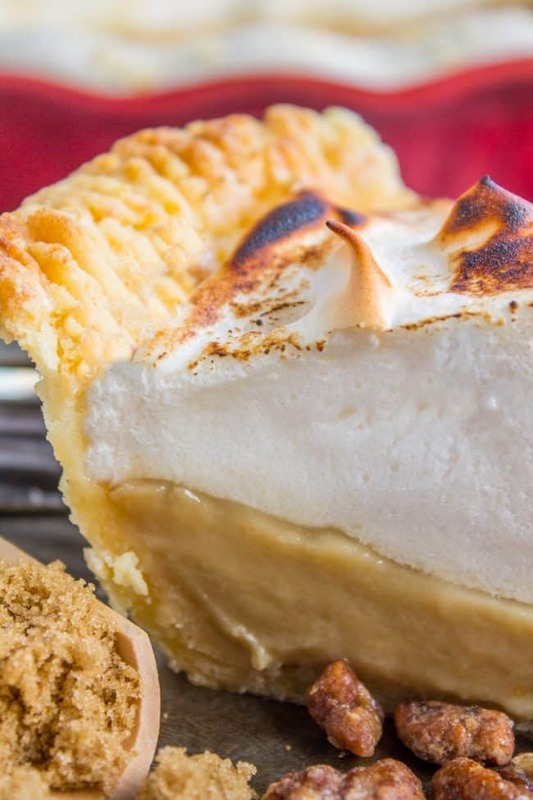 I use my grandma's old trick of poking toothpicks into the top of the pie and putting plastic wrap over the top, so you don't ruin your meringue. *You need 14 tablespoons of fat for this recipe. You can do part butter/part shortening (I use 1/2 cup butter + 6 tablespoons shortening), OR all shortening. 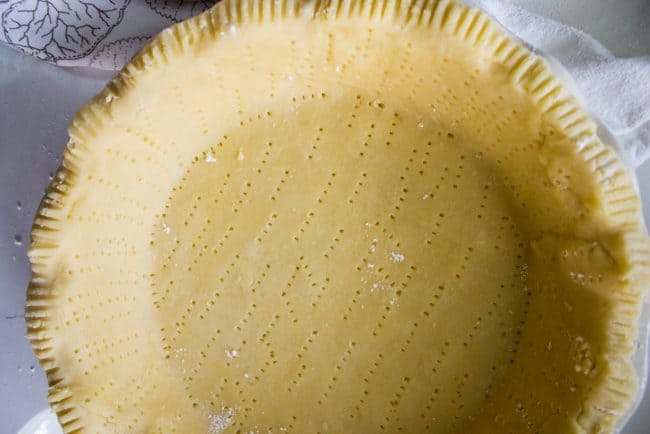 Usually for most pies I choose half butter/half shortening, but for this recipe you have to pre-bake the pie crust before you add filling, so I used all shortening. Shortening has a higher melting temperature, which means that it holds it's shape better once in the oven. **HEADS UP ON THE EGGS: You will need 4 large eggs for this recipe. All of them need to be separated. 1 egg yolk goes in the pie crust, 3 yolks go in the butterscotch pudding, and all 4 egg whites go in the meringue topping. 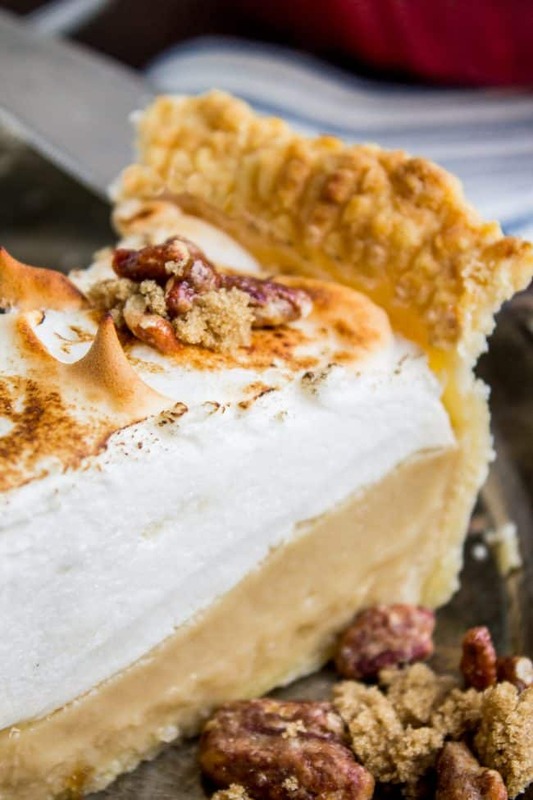 The pudding for this pie is adapted from this recipe for Butterscotch Pudding with Roasted Banana Whipped Cream, and the meringue is from Better Homes and Gardens. More pies you are going to love! 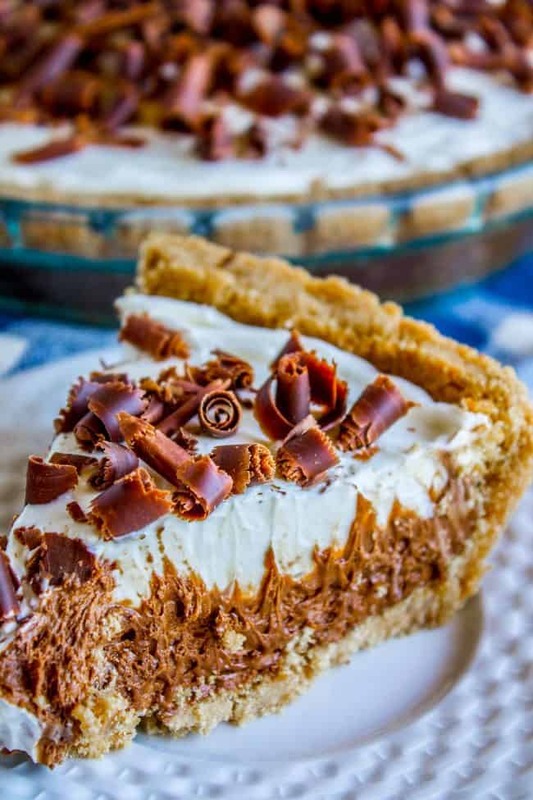 Classic French Silk Pie with Really Thick Graham Cracker Crust << I love this pie! 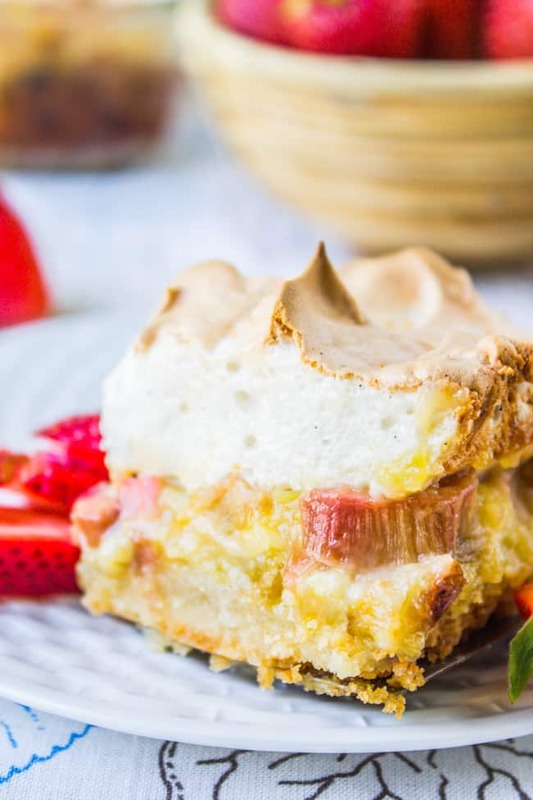 Rhubarb Meringue Layers << one of my all time favorite desserts! 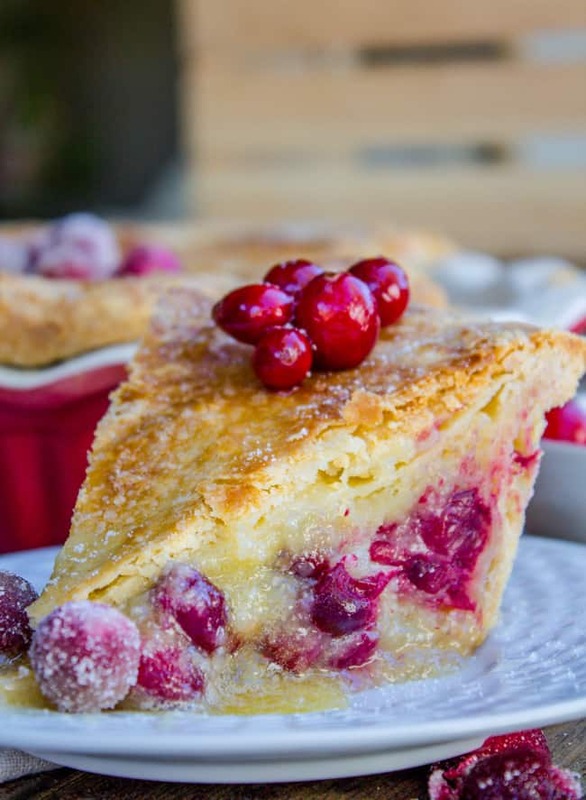 Cranberry Custard Pie << if you haven’t tried this pie yet, you haven’t lived!! It’s perfect for Thanksgiving! More delicious holiday pies from friends!